Lately, Twitter has been down more than the ground. So many are commenting why Twitter is having so many issues: scalability due to Ruby on Rails, mainstream adoption from press and media, or even just Scoble after two many cappuccinos. 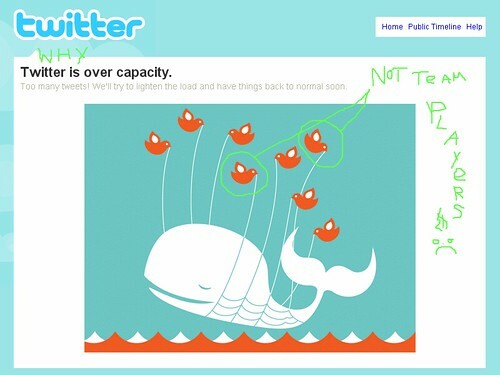 After painstaking analysis of Twitter’s 404 page (above image), I’ve found the reason for the downtime of Twitter, it’s not what you expected: the infrastructure, users, or external factors, it really comes down to poor deployment of internal resources. Whales can only go one way, gotta get those birds going the same way. Did you like this? Digg it.